The Fellowship was fortunate enough to obtain a copy of ITTY BITTY COMICS: THE MASK #3 from Dark Horse Comics. The story is written by Art Baltazar and Franco, and illustrated by Art Baltazar. The Mask is created by Mike Richardson. 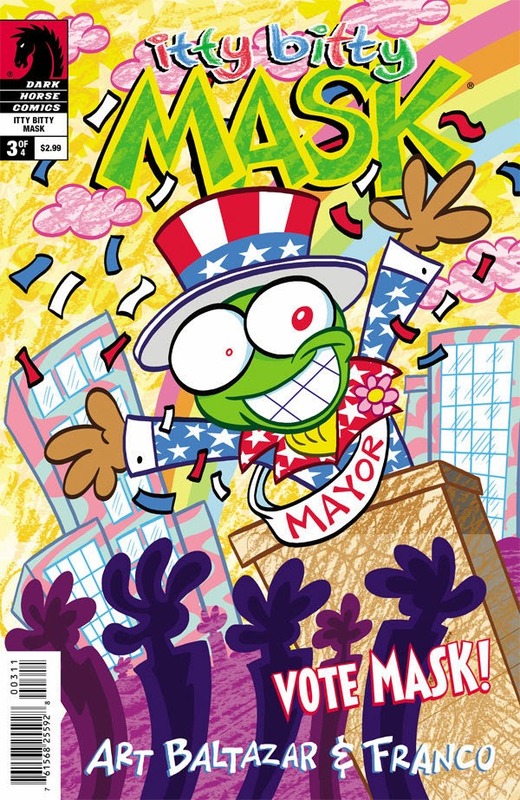 The Mask has found its way to the Mayor who is celebrating his inauguration. He gives the police new uniforms and vehicles (rainbow colored), declares that streets run in circles, and institutes new health initiative. To top it off, he takes a huge bite out of the moon. This last action ire the Moon Martians (?) and they decide to retaliate. As things look horrible, the Mask finds its way back to Mr. Shazbert. Hooray? What a crazy, goofy, fun book we have here. It’s a breath of fresh air after reading other titles. Baltazar and Franco have crafted a witty, chaotic tale punctuated by the bright, colorful art. I wouldn’t have a problem giving this book to anyone at any age and let them enjoy themselves. Another winner from the dynamic duo and Dark Horse. ITTY BITTY COMICS: THE MASK #3 is in stores now, or available for ordering at www.darkhorse.com.